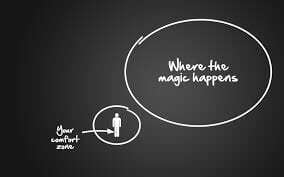 Incremental growth happens inside of your comfort zone – exponential growth happens outside of your comfort zone – your discomfort zone. Think of public speaking, networking, leaving your job and starting something new, cold calling, conflict, saying no, taking an unpopular stance when you think it’s right, challenging inappropriate behaviour etc. When you pushed through fear and discomfort to take on a similar challenge in your life, didn’t stepping beyond your comfort zone open up a new world of experience, growth and depth in life? Something became possible that was not possible before. In our experience, the rate at which a leader grows and develops is determined by their capacity to be uncomfortable and still behave and act in ways that have integrity for them. The single greatest threat to a leader’s growth and development is staying comfortable by responding in ways that do not have integrity and keep them within the boundary of their comfort zone. No expansion, no growth. Just so that you can experience this, why don’t you try it out next time something happens that makes you feel really uncomfortable. See how you respond, does your response have integrity for you or do you avoid, distance yourself and sell out in some way? What keeps this dynamic in place is blind spots. It’s what you don’t know, that you don’t know. Becoming aware of these blind spots (self awareness) is the access to exponential growth. Here is the catch – this requires insight about something you don’t currently see, so you can’t do this without input from an external source (asking others for feedback, reading books, working with a coach). If you could see your blind spots, they wouldn’t be blind spots. Here are some blindspots that keep you in your comfort zone and stop growth. 1. You blame something outside of yourself for the discomfort and therefore are powerless when it comes up. For example in public speaking, it’s what the audience is going to think of you instead of your fear of looking stupid. 2. You think that what you fear is real. This is also true of assumptions. You think you know what others are thinking and in particular, what they are thinking about you. For example, you think that if you say no, then the other person won’t like you or you will disappoint them. 3. You think that the way you feel is unique to you and you keep it to yourself as it’s something to hide. For example, in meetings when you are unsure of how valid your point is you don’t raise it. You think self-doubt is yours alone. 4. You’re not aware of the costs for you and the people around you of staying in your comfort zone. What about working those long hours and not spending time with your loved ones because you are concerned about failing or disappointing someone? Next time you feel yourself backing away from something that is uncomfortable, use the above points to examine your blind spots and see if that helps you respond in ways that have integrity for you.